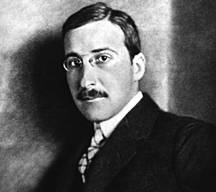 Stefan Zweig (German: [tsvaɪk]; November 28, 1881 – February 22, 1942) was an Austrian writer of Jewish descent. He was born in Vienna. He volunteered to be a soldier in the First World War, and got the post as a military commentator. This made him an enemy of war. The Nazis gained power in Germany in 1933, and their influence could be felt in Austria as well. 1934, Stefan Zweig emigrated, first to London, then to South America. That way he lost much of his audience. He committed suicide (together with his second wife) by barbiturate overdose in Petropolis, Rio de Janeiro in 1942. He has written many books and poems. One of his best-known works is called 'Schachnovelle (The Royal Game, in English. In it, he describes a Chess player, that is forced to play against himself (while imprisoned). He explores the theme of madness. This book inspired the movie Geri's Game, made by Pixar in 1997. Darién J. Davis; Oliver Marshall, eds. (2010). Stefan and Lotte Zweig's South American Letters: New York, Argentina and Brazil, 1940-42. New York: Continuum. ISBN 1441107126. Wikimedia Commons has media related to Stefan Zweig.